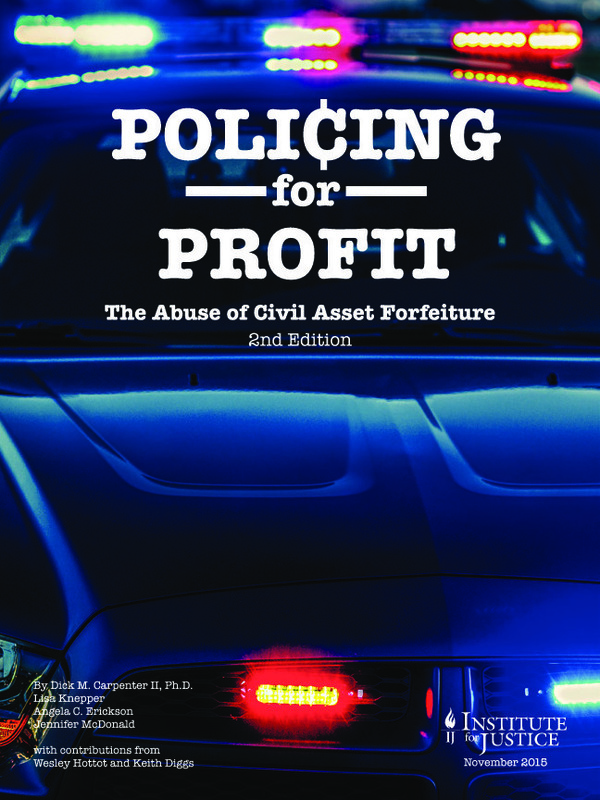 Scholarly research finds a link between state civil forfeiture laws and federal equitable sharing: The tougher it is to generate forfeiture revenue under state law, the more equitable sharing payments state and local law enforcement agencies receive. In a 2011 study published in the Journal of Criminal Justice, criminologists Jefferson Holcomb, Tomislav Kovandzic and Marian Williams found that a lower share of state forfeiture proceeds allowed to flow to law enforcement is associated with higher annual equitable sharing payments from the Department of Justice.1 The first figure below illustrates the implications for a hypothetical law enforcement agency of average size: With each 25 percent reduction in law enforcement’s cut of state forfeiture proceeds, annual equitable sharing payments increase $6,000.2 So if an agency receives $120,000 in equitable sharing proceeds when there is a 100 percent state-law profit incentive, it can be expected to receive $144,000—or $24,000 more—if the profit incentive is eliminated. The authors also found that making it harder to forfeit property under state law by improving protections for property owners is linked to more equitable sharing. As the second figure illustrates, a hypothetical agency that receives $120,000 in equitable sharing when the state standard of proof to forfeit property is mere probable cause will receive $152,220 when forfeiture requires proof beyond a reasonable doubt—a boost of $32,220. Likewise, shifting the burden of proof in state innocent owner claims from the owner to the government yields an increase of $12,840, as illustrated in the third figure. In short, when civil forfeiture is more difficult and less financially rewarding under state law, law enforcement agencies turn to federal equitable sharing instead. Not only do these results indicate that law enforcement uses equitable sharing to circumvent state law, but they also provide compelling evidence that pursuit of revenue is a key motivator in forfeiture proceedings.